This 3-story, 4000 square foot home is situated on a unique bluff overlooking beautiful Lake Murray. The home is located in a quiet subdivision on the western end of the lake where two rivers merge together. Architect-designed, three-story, cottage-style home. Living room, dining room, kitchen, master bedroom, master bath, half bath, laundry, screen porch and Charleston porch on main floor level. Four bedrooms and three baths on top floor. Game room/TV room, kitchen, two bedrooms, one bath, and Charleston porch on bottom floor. 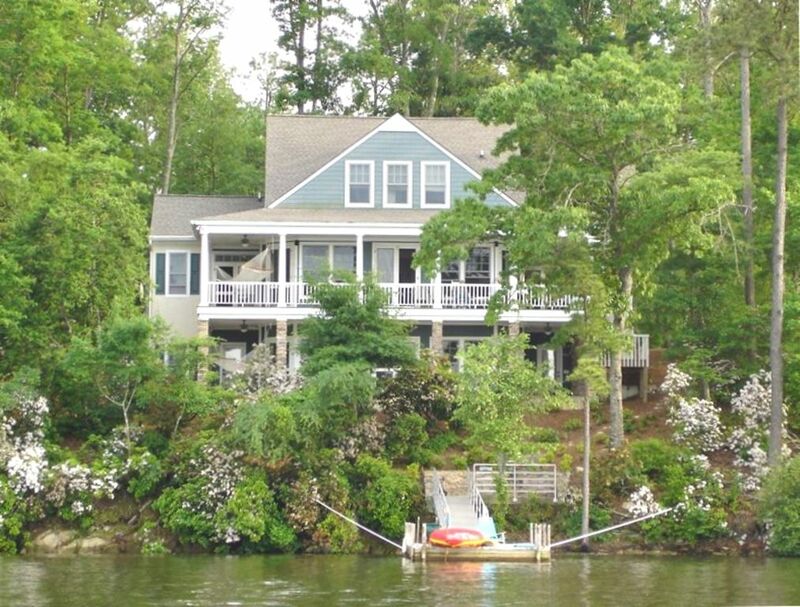 Two Charleston-style porches face the lake, as well as a screen porch with stone fireplace. Porches have eight foot doors that open to the living room, dining room, kitchen, and master bedroom. All rooms have ceiling fans, and three heating and air conditioning units provide ample cooling and heating for each floor. Large dining table seats ten to twelve with a bar area that seats five. 47" HDTV with DVD in the ground floor game room and 39" HDTV in the main living room. Indoor game activities include Ping Pong table, Foosball table, and board games. Outside area includes a deck, 2 private boat docks. 18 foot water depth at low lake level. 30 foot water depth at full pool. Our private lot next door has volleyball/corn-hole area and beach--also room for extra parking (boats, cars, etc.). Ideal for Family, Small Groups, or Corporate Retreats. No Smoking and Pets are NOT allowed. Maximum guest limit is 13. Have fun swimming, boating, fishing, jet-skiing, water-skiing, birdwatching, walking, playing volley ball and corn-hole, and exploring the lake as well as the nearby Big Saluda and Little Saluda Rivers. The lot has many nice hardwood trees as well as native mountain laurel. There is a one- and two-mile walking area and nearby golf courses (Persimmon Hill C.C., Mid-Carolina C.C. & Ponderosa C.C.). The Augusta National (The Masters Golf Tournament) is located approximately one hour away. There are also numerous restaurants, shopping centers, antique stores, drive-in movie theater in nearby Monetta, small towns, metropolitan airport, and the Newberry Opera House in close proximity. There is also a pontoon boat rental facility located less than 1 mile away. Masters/Augusta National close by---50 to 60 minute drive-----much cheaper than hotels/motels. Also applicable to USC graduations. toilet, combination tub/shower, On top floor, single vanity, and shared by BR's #3 and #4. Linens are provided for King, Twin, and Double Beds---Guest need to bring linens for 4 Queen Beds unless problem arises b/c of airline baggage issue. Ample parking on main lot and next door lot for cars, boats, etc. Guest should bring at least one bath towel and beach/swimming towel per person unless problem arises b/c of airline baggage issue. Volley Ball court, also suitable for Corn-Hole, Horse Shoes--also serves as beach area. Basketball goal. Masters/Augusta National close by. Property also has 2 Private Boat Docks, 2 Gas Fireplaces, 1 Woodburning Fireplace, Gas Heat, Satellite TV, 2 Charleston Porches with ceiling fans, Screened Porch, 2 Full Kitchens, 2 Refrigerator/Freezers, Pawleys Island Hammock, Volleyball/Corn Hole area. Because of 20/30 foot depth of water small children or non-swimmers should be monitored at all times. The perfect setting for catching up with friends and family! The layout of the house was ideal for our group of 6 couples all down for a fun week of watching our boys play spring college baseball! The house was very comfortable and well equipped. The owner was very welcoming and attentive from planning to departure - an excellent experience! We’ve already passed on the info to next years’ senior parents. The house was beautiful everything we wanted and more. Mackey was great and offered some good advice. I would book this home again in a heartbeat. Fully equipped kitchens, gorgeous lake views, 3 fireplaces, plus game equipment made it a great stay for my entire family during the Christmas holiday season. This is a year-round vacation home. Fabulous Week on Lake Murray! We absolutely loved the location of this beautifully designed and fabulously equipped lake home. Our family gathered to celebrate my husband's birthday and planned our trip to allow for a day at the Masters' practice round - about an hour drive to Augusta National. We rented a pontoon boat for boating and fishing on the days the weather cooperated - and enjoyed the sandy beach. When the weather was more threatening, we enjoyed the game room, esp. ping-pong. Having two kitchens and two large tv's turned out to be a great for our family and friends. We enjoyed the fireplace on the screened porch on two evenings - a beautifully designed room :) Views from the porch are stunning and the sunsets rival any we have ever seen! Porch sitting was a great sport for some, using the hammock daily. The home is solid, clean and very thoughtfully designed. Owner was very responsive and helpful :) What a fantastic location for us to make so many lovely memories!!! We had a great time during our stay here on Gold Nugget Point. It's on the West end of the lake so it's relatively quiet compared to the East end where the dam is but this lake is so large it's pretty quiet no matter where you are. It does take a while to boat to the East end, like 1 1/4-1.5 hrs to the dam. From the water, the east end has the Liberty Tap Room and some of the nicer restaurants except Spinners that's at the West end. There are plenty of less fancy restaurants accessible at the West end. The party coves, areas to beach your boat and Bomb Island where the Purple Martins roost are more at the West end too. So it depends what you're looking for. After you get past the State Park in the middle of the lake it gets windier and choppier but nothing my pontoon couldn't handle. Boat launch is 5min drive/boatride away at Riverwinds, costs $5 to launch and free to pull out. Call around for gas prices as some were twice the cost of land gas. You can tube/ski/wakeboard etc right off the dock, it's wide enough. The water clarity was dark, unlike Keowee where you can see 10ft down but unlike the Intracoastal Waterway where you can't see 1 inch down. The water temp was a perfect 84. I felt safe in the water, just saw turtles and the land was cleared before they flooded the basin so no stumps hardly and well marked if there were. As far as land fun, you don't even have to leave the grounds for the week. The sand volleyball is awesome. The beach they have is elevated at the top of the bank, not right on lake level FYI. The empty lot next door is a huge bonus to park your vehicles/boat trailers, to build a smore pit and play volleyball etc. There's a basketball hoop. The outdoor grill is nice and big. The screened in porch was nice once it cooled off. The back multilevel deck was huge and provided gorgeous views and a hammock. The dock was nice and swim ladder sturdy. You can use the empty lot dock too but no ladder on it. We blew up a floatation station and tied it off between the 2 docks and had a ball just hanging out. The downstairs floor is perfect for kids to get away from the parents and retreat to Foosball, ping pong etc. The house was very clean and kitchen provided everything you might need. Having 2 fridges and an ice maker was a huge plus! Mackey is very friendly and offers lots of nice tips on how to control the TV, grill, A/C etc. The only thing the house does lack is WiFi so bring a hot spot. We hit the Monetta Drive In which is real neat. Quiet streets for jogging, biking, & walking, Unique Drive-In Theater @ nearby Monetta, Newberry Opera House for live stage performances, 3 public golf courses (Persimmon Hill, Mid-Carolina & Ponderosa) located 10-20 miles away, Pontoon boat rental only 1 mile away, Historical Revolutionary War sites in the area, Columbia Airport less than 1 hr. away. 1 hour to Augusta National and Masters golf. About 50 minutes to downtown Columbia and University of South Carolina. 3 night stays regardless of season are $475 per night (owner may consider 3 night stays (instead of 4 nights) if there is less than 60 days to projected arrival date). A 6-night stay during prime season is $2600. Christmas week/dates are subject to prime season rates. There is also a $200.00 cleaning fee for all stays as well as 8% SC tax assessment. Send inquiry to owner.